10:15am on the 29th of November and we are on our way. I am calling you from 2950 meters, just passed the Horcones Visitor Center and ranger station. 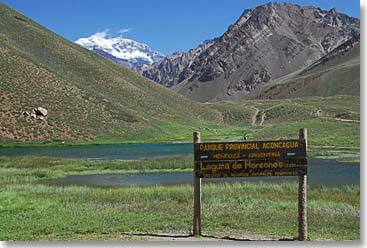 We’ve entered Aconcagua Provincial Park, you can hear the wind in the speakers of the satellite phone, I think, but you should know that it is also a glorious day. 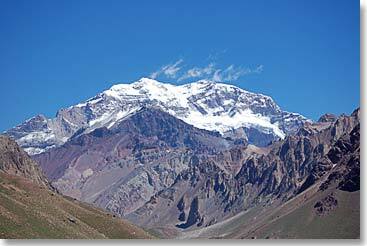 Aconcagua rises above us in a perfect blue sky. 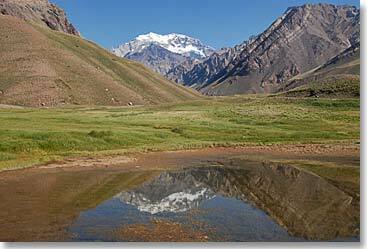 I am calling you from that beautiful little lagoon where the sign is welcoming visitors to Aconcagua Provincial Park. This is going to be a big climb. We drove out from the hotel in Osvaldo’s 4-wheel-drive vehicle with just our day packs, the rest of the gear has being sent with the mules already. Osvaldo drove back to the corral to park the vehicle and he will walk quickly to catch up with us. Right now Dan, Neil, myself, and of course Maria and Sergio are beginning to walk at slow pace towards Confluenza camp. I said it is a beautiful day. We are happy to finally be on our way by foot power and we are very much looking forward to the adventures and challenges ahead. 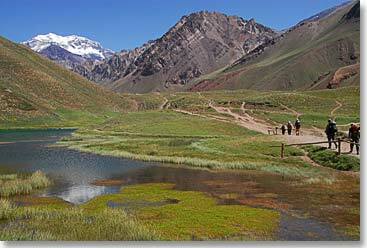 We will keep you posted each day as we work our way first towards Plaza de Mulas and eventually high onto the slopes of Aconcagua and we hope to the summit. 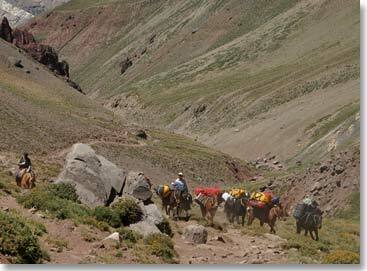 Our gear has been sent with the mules to Confluenza and Plaza de Mulas.